A publishing project by Daz Darus. A designer planner for the go getter! A proven goal setting, productivity system and strategy formulation for conquerors. Build your EMPIRE in 2017. 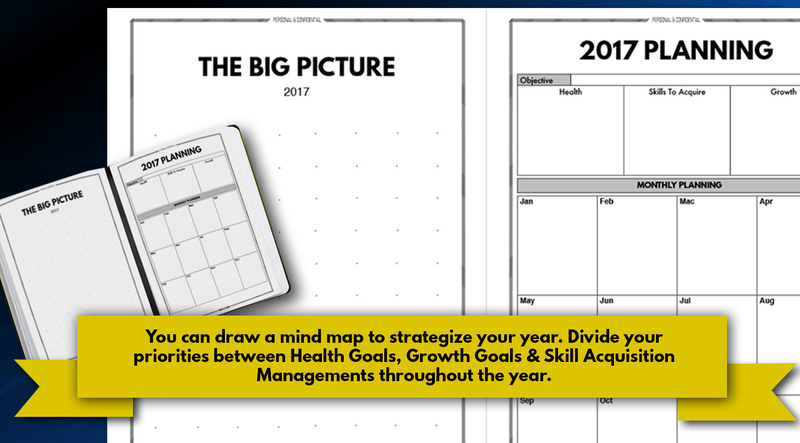 THIS PLANNER CONTAINS GROWTH MANAGEMENT, HEALTH/FITNESS GOAL & SKILL ACQUISITIONS MANAGEMENT TO HELP YOU EXCEL IN LIFE. Many of us have many dreams that we want to realize. However, along the way we are busy doing the things that we need to pay the bills, to satisfy our boss or teachers. If you are tired of the things that tied you up from achieving your dreams, then you need Conquer X Planner. You are one step ahead to start accomplishing the things that you truly wants. 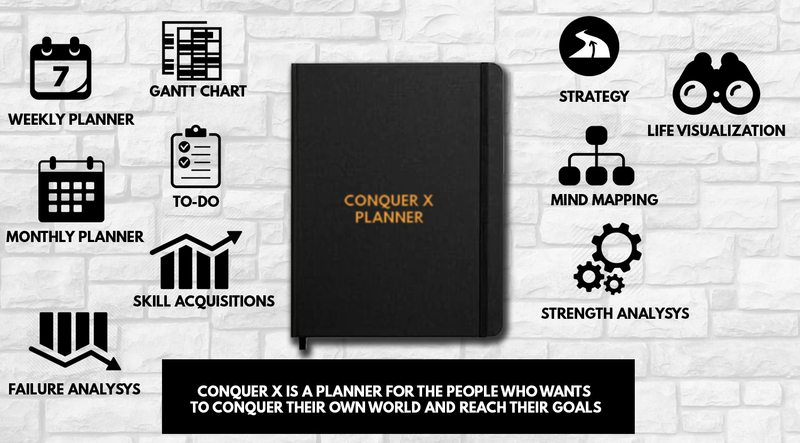 The Conquer X Planner is systematic, polished and inspiring tool to make you successful. We have incorporate many proven methods on strategizing and implementing your goals into an all-in-one planner. Start the day by dreaming the best things that you want to achieve this year and use Conquer X Planner to brainstorm your strategy to achieve in 2017. • Conquer X Planner is a flexible tool. 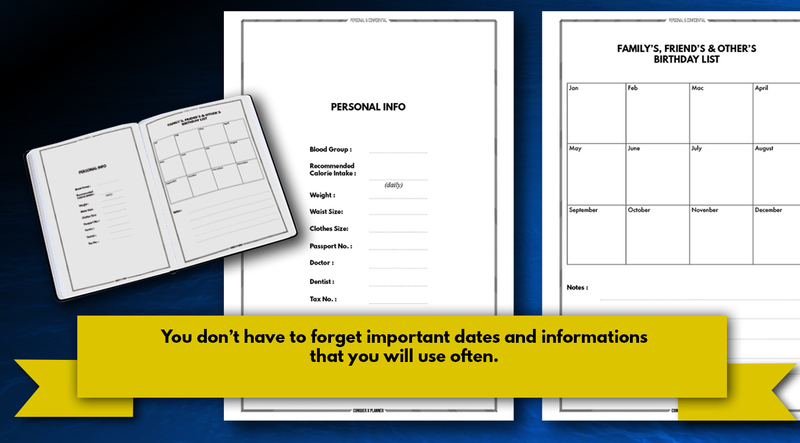 It a date free planner that you can use in any weeks, months or year without problem. 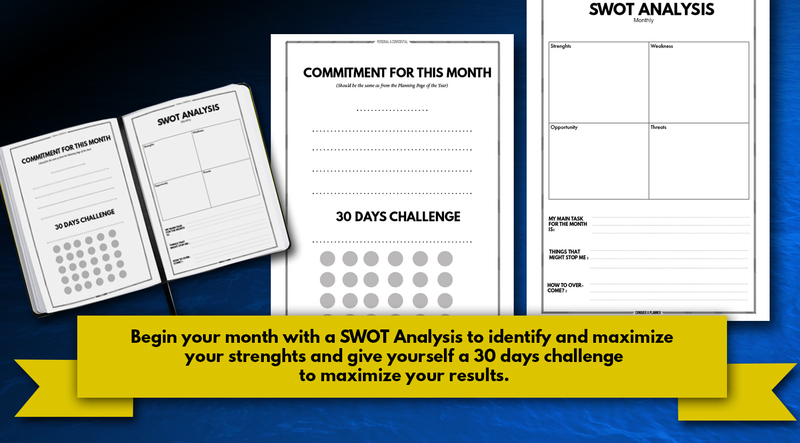 • Yearly and monthly SWOT Analysis. It is a very useful tool to identify and solve your strengths, weaknesses, opportunity and threats. • Sometimes things don't go as planned. Conquer X Planner is flexible enough for you to change course, or extend the goals. 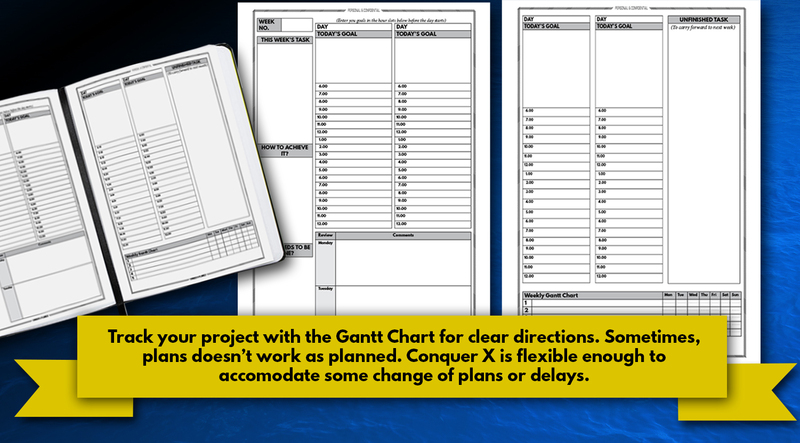 • See the progress you've made by charting the Gantt Chart section on every week. • Specially design end of the month review to ponder, improvise or re-strategize your goals. • tools for Skill acquisition technique adapted from Josh Kaufmann's best selling book "the first 20 hours of learning anything..fast"
Whats in the Conquer X Planner? • A.) Find and believe who you are. 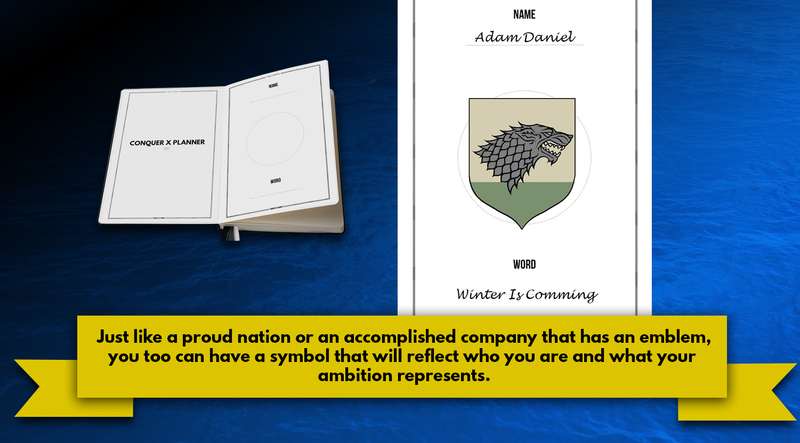 Just like the Batman or House Targaryen, you can give yourself a conquering symbol to identify your new or existing self. Visualise your future on paper for you can see the Big Picture everytime you use the planner. • C.) Important dates to remember. Set what you want to achieve on health, skills and growth and plan what you want to achieve during the months of the year. 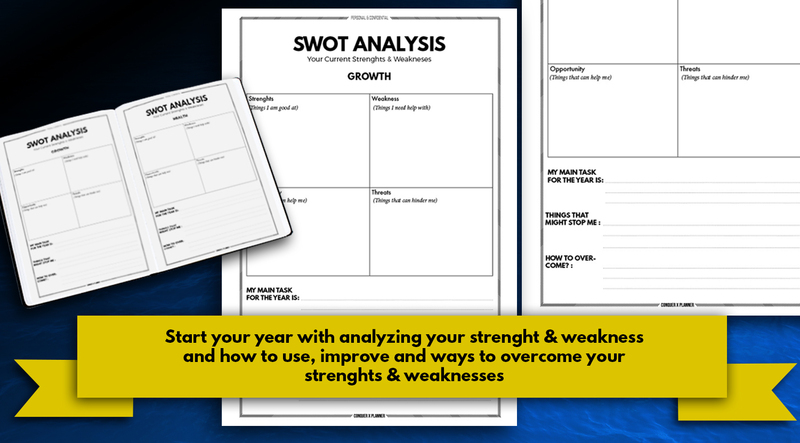 • E.) SWOT analysis on the growth, skill acquisitions & health for the year. • F.) SWOT analysis for every month of battles. 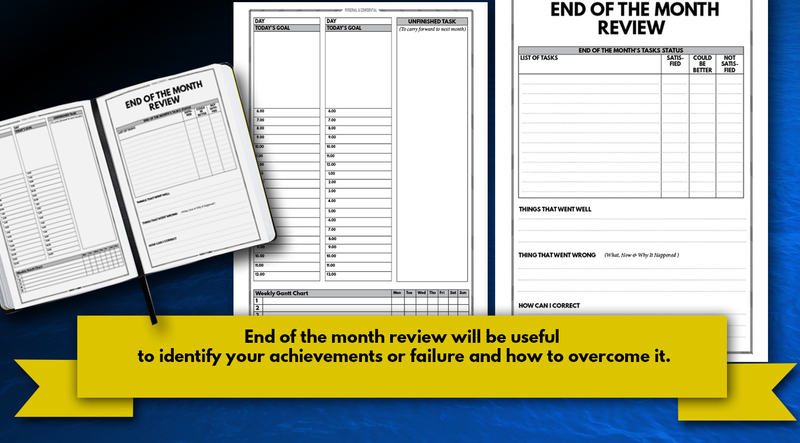 Visualise your monthly goals and plot the to-do lists in order to achieve those goals. Use the weekly planner to track your day-to-day basis right to the hours you would like to spend. Use the daily review to reflect you days of work. What you had achieved and what's not. Identify your achievements or failure and how to overcome it.